Times have changed, and people’s taste and wants too have changed and though what is inherent to our culture shouldn’t be subject to this change, sadly, it is. The arrival of Dashain is announced by a bout of chilliness in the air, the long bamboos that make up the swings and skies dotted with colorful kites. The air is abuzz with excitement and ringing with promises. 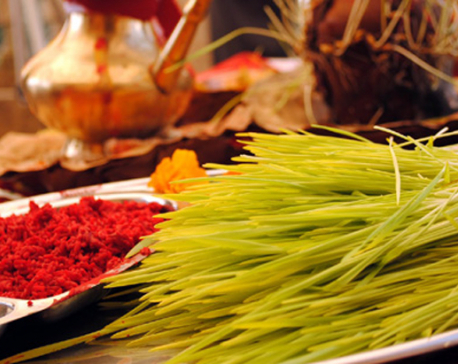 In Nepal, Dashain is as much about celebrating traditions as it is about merrymaking. Playing cards, jumping on the swings, and flying kites are some cherished aspects of this festival. Their absence dulls the festivities. Kite flying originated in ancient China. It was then meant as a symbol of prayer for the departed souls and flown over their funeral pyres. This custom came to Nepal then but with alterations in meaning. Everything in Nepal then always revolved around the weather. Traditions and rituals took form in order to appease the lords, so that they may bless the lands with good harvest and agreeable weather. At times, the heavy downpour of rain worried farmers so they flew kites as prayers to Lord Indra. It was their way of trying to placate the lord to have mercy. 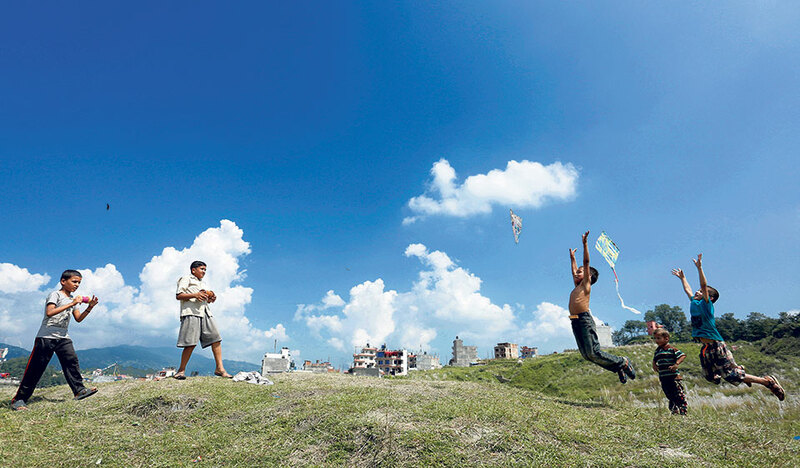 Since then kite flying has been an integral part of the Nepalis culture. 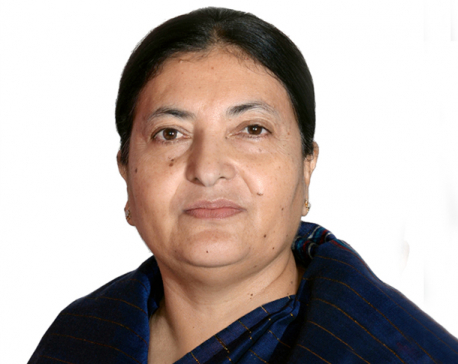 They are flown from the months of Asar to Kartik according to the Nepali calendar but less so these days. Looking at our skies today it’s safe to assume that kite flying is a custom that’s on the decline but Sunder Man Manandhar and Mohan Man Manandhar don’t think so. Their family has been in the kite selling business for over three generations (60 years) and they have seen kites soaring in the skies all through their childhoods. They have also run at full speed chasing kites that were close to falling. They have stood witness to the highways of Kalimati (where they were born and trade to this day) change from a rural village to the bustle of energy that it is today. And, all throughout, they have seen times change and trends come and go. “Compared to the past, the number of people who fly kites is at an all time low, but because the population has multiplied over the years we haven’t really seen a decline in business,” says Sunder. Sunder and his brother Mohan belong to a family of kite makers who have seen kites evolve with time. In early times, kites weren’t the colorful exhibits that they are today. Then they were paper-made and modestly colored. Kites made of Nepali paper were quite a crowd favorite. Now kites of Nepali paper have all but vanished. Sunder explains that it is because such kites end up costing 10 times more than a regular kite and people are always looking for cheaper alternatives. Add to that the sheer work it takes to make one as Nepali paper isn’t one that creases and folds compliantly. So it takes specialized skills to make a kite out of Nepali paper. Sunder admits that they rarely if ever make Nepali paper kites anymore. To his knowledge, only his father makes them. And that too may soon cease, considering how, with age, his father’s fingers have lost their dexterity. Kites in Nepal today all come from Kolkata in India. They have, for a very long time. And the dealers themselves date back to generations. With times changing, they have had to adapt to people’s preferences and current trends. It therefore comes as no surprise when the kites brought into Nepal feature colorful illustrations of all too familiar animations. There have been changes in the build of kites, materials used (to make them more affordable) and the colors too. The colors are more vibrant than they used to be in the past. “They look like a rainbow,” Mohan exclaims. 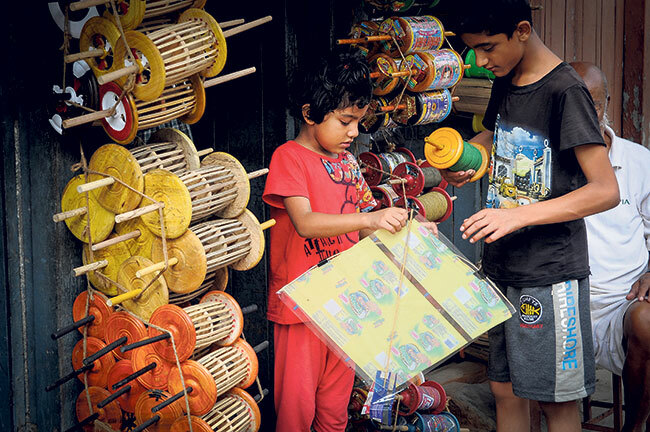 Despite this being a family business, kite selling isn’t all that the Manandhar family does. It’s impossible to make a living otherwise. Kite selling fares well only from the months of Ashar to Kartik. During the rest of the year, the family splits up to look after their own businesses. It is only during the months when demands for kites rocket that they come together, all of them, from the early hours of seven to the late evenings until eight. It is a family thing, they say, and thus impossible to let go of. However, they also say that they are uncertain of the future. “My children show no interest in taking it up after us. It is the same with my brother and it even extends to the ‘lattai’ makers of generations,” Sunder says. The ‘lattai’ makers, he says, have been in Nepal for generations. Most of them live in Swayambhu and Sitapaila and even they express concerns about the future of their trade. There is no one to take up the family business after them. Kite flying is a custom in decline. Where there once used to be ‘changa chett’ programs in Nagarkot, Sankhu and Bhaktapur, there are only a few such events these days. The youths have lost the enthusiasm to fly kites, says Sunder. “They prefer flying kites on their phones instead,” he laments. This decline in kite flying isn’t a realization that only the Manandhars have come to. 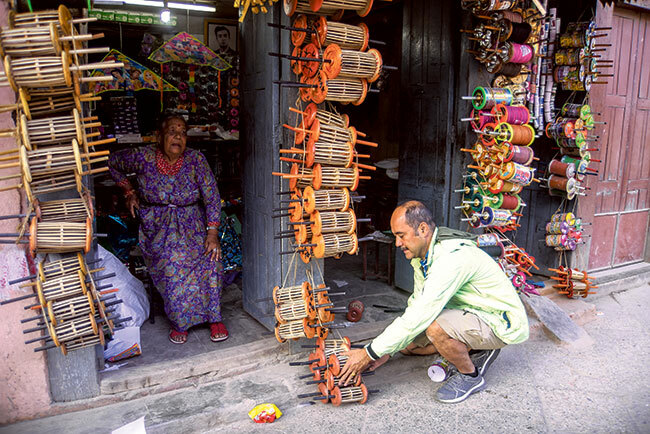 Dev Kumar Khadgi, a kite seller in Maitidevi in Kathmandu, too believes that people have lost the zeal to fly kites during Dashain these days. He has been selling kites for 48 years now and says it’s really sad that youths are oblivious to the tradition. “There is no game and play today. 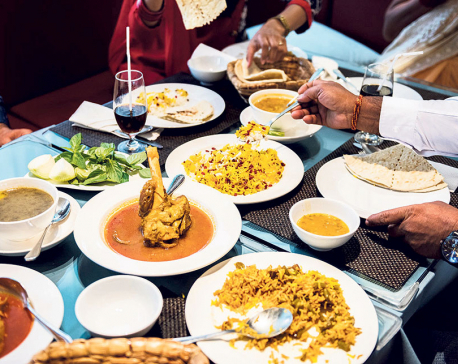 People have no appreciation for traditions anymore,” he says. He further explains that there are hardly any open spaces in Kathmandu anymore with urbanization having taken over the city. It’s difficult too, he admits, disheartened by the thought. Agreeing with the Manandhars, he mentions that Nepali paper kites are now a thing of the past. He also adds that very few people seem to want to fly kites these days and there is no point in taking so much trouble to make kites when the market is dwindling. “But those who are selling have too keep up. Through times and people, we have to continue,” he asserts. Times have changed, and people’s taste and wants too have changed and though what is inherent to our culture shouldn’t be subject to this change, sadly, it is. Without the enthusiasm of the youth and a renewed fervor among the masses, kite flying might just be a tradition that the future generation will only get to hear of.